We’ve reached the point in the program where requests for #DrownYourTown are coming in faster than I can process. That’s great! It means people are really connecting with the #DrownYourTown hashtag as a way to bring the concept (if not the specific details) of sea level rise home. The response has been greater than I ever imagined! So, rather than leave people high and dry (we wouldn’t want that, would we), here is a step by step guide to simulating sea level rise anywhere in the world using Google Earth and a little geographic wizardry. The best part? It can all be done with completely free software. 1. Download Google Earth — you can find it here. Take some time to play around with it. Google packed this free package with some awesome features. 2. 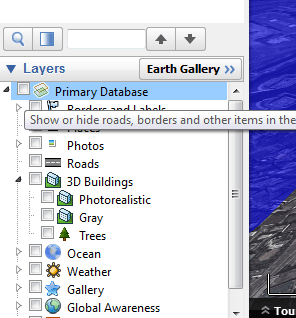 Clear the world — On the left, under the layers tab, click the box next to Primary Database to disable all layers. This give you a nice, clean world to work with. 3. 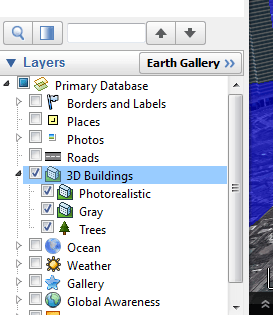 Make some buildings — In the Primary Database, re-enable 3D buildings. This gives you those cool 3D cityscapes that really bring the message home. 3b. Add some labels — (optional) Also in the Primary Database, re-enable Borders and Labels. This will help you navigate the world by labeling key features. 4. Make a square — Open up your favorite illustration software (I use Inkscape, but you can get along just fine with paint). Draw a perfect square with no borders and fill it entirely with blue (or brown, or green, or lava). Save it as a .jpg. 5. Create an image overlay — On the upper bar in Google Earth, click the “create image overlay” button. Name it something obvious and link it to your square. 6. Wrap it around the world — Under the location tab, set to North 90, South -90, East 180, West -180. This will stretch and wrap your square around the world (UPDATE: some users are reporting problems inputting coordinates, try inputting 90° 0’0.00″N; 90° 0’0.00″S; 180° 0’0.00″E; 180° 0’0.00″W). 7. Set the height — Under the altitude tab, set the drop down list to “absolute” and enter your desired height of sea level rise. 8. Make it clear — On the transparency slider, slide it until you can see through your layer, otherwise you won’t be able to see beneath your simulated sea level rise. Click “Ok”. Set the altitude. Set the transparency. 9. Explore the world — Go check out your home town. Play with the movement controls in the upper right-hand corner of the map. Dragging the eye around will change the perspective so you an get down into the streets. 10. Take a picture — Click the “Save Image” button on the top toolbar. 11. Tweet the hashtag — Don’t forget to upload your simulated sea level rise image to twitter. Use the hashtag #DrownYourTown to share it with the world! And there you go. You are now an official #DrownYourTown Town Drowner. Go forth and spread the word. As always, please remember, Caveat Tweetor — Twitter beware. These are not perfect models of sea level rise, they are just useful (and entertaining) visualization tools. The topology in Google Earth is not perfect (you will find places where the sea itself is higher than you sea level rise layer). CNN is airing “Blackfish” Thursday at 9. Watch with us and join the live twitter chat! Did it! So awesome. Thanks for the instructions! 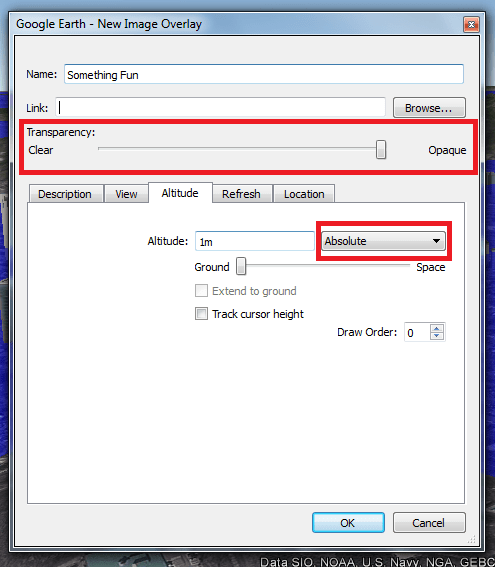 You can also enter the full coordinates – 90° 0’0.00″N, 90° 0’0.00″S, 180° 0’0.00″E, 180° 0’0.00″W.